They said May 29 was Italians. I say it was collateral. Offshore repo collateral, to be specific. Because we keep seeing May 29 show up everywhere, what happened that day matters. Getting the story straight allows us to properly analyze the craziness in between then and now. From that, we hope to get a better sense of what comes next. Two things stand out immediately with regard to May 29. The first is the facts of that day; bond markets around the world were suddenly and sharply bid. You can call it flight to safety or liquidity preferences. Whichever you choose, the yields for the safest, most liquid instruments plummeted. Not only that, they did so at a time when by booming economy standards they should’ve been trading harshly the opposite way. The second is how May 29 was officially but indirectly characterized. The FOMC a few months later in its policy communications referred to it as “strong worldwide demand for safe assets.” You could feel the indignation in their statement; how dare bond market investors so publicly, openly disagree with the central bank’s assessments. That the FOMC felt it necessary to write anything at all about it tells you something. 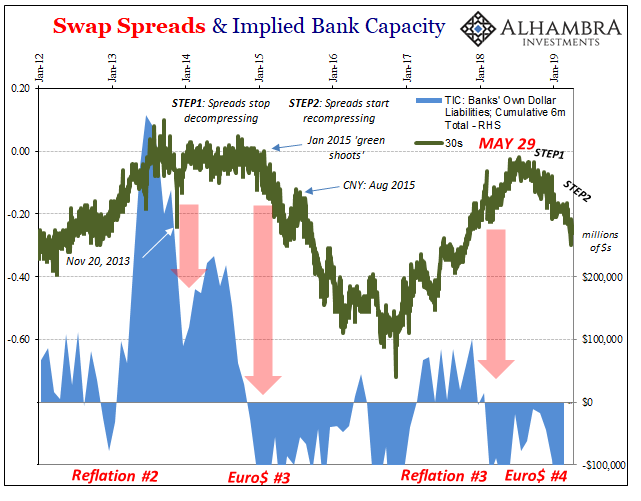 They had to put out some kind of statement because immediately following May 29 things really started to go screwy; curves dropped and one inverted (eurodollar futures). We know it had to have been something substantial if it briefly disturbed the sleepy Federal Reserve committee from its boom dream. But where can we find the evidence to settle the matter? As in times past normally we would see it in repo fails. These, however, the estimates collected by FRBNY from the domestic Primary Dealers, hadn’t registered a thing during this period in question. All quiet in fails. What dealers report to the New York branch, though, is only one part of the vast global repo market network. There were other collateral indications, too, about May 29. Before and after. Gold was a big one. The metal’s price drops, often “pukes” (right at the open) whenever gold is being used as global collateral of last resort. Therefore, even if the domestic repo market was undisturbed (because of the T-bill deluge) it didn’t necessarily speak for the whole. Part of the problem analyzing this global system, and this goes for more than repo, is terminology and intuitively understanding motivations. What is it that these banks are doing, and why are they doing those things? A repo is technically a repurchase agreement. One party agrees to sell a security from another party while also agreeing to buy it back, or repurchase it, at a specified future date. If you didn’t know any better, you would wonder what this was and why anyone would do something like that. Once you get how this is really a collateralized loan, it begins to make sense. There is history behind why it remans a repurchase agreement (the Fed is, of course, involved). It should just be called what it is, a secured interbank loan. But there are variations on the theme which complicates matters even further. Not every repurchase agreement is settled by cash. Some are essentially swaps: one security pledged for another with the agreement that both will be re-exchanged, repurchased if you like, at maturity. A better way to say this form of repurchase agreement is a collateral swap, typically as one leg in a multi-dimensional transformation process (I’ll get to this later). But for the cash variety, the simple secured interbank loan, a repurchase is where you are the cash borrower. You are “selling” the security to the other part, obtaining that party’s cash with the security as collateral for the loan, and then agreeing to buy it back meaning repaying the cash (plus interest) and having the security returned to you (and it’s not necessarily the same one which comes back). If you are instead the cash lender or owner, this is a resale rather than a repurchase (it’s also called a reverse repo). It’s exactly the same thing just from the perspective of the cash owner; you are buying the security at first, handing over cash, and then selling it back at the future date for the cash you fronted in the beginning (plus interest). The US Treasury Department’s TIC data is one of the very few attempts to peer inside these offshore monetary shadows. Not on purpose, quite by accident, TIC gathers information reported by US banks on their cross-border activities with counterparties operating in these shadows. 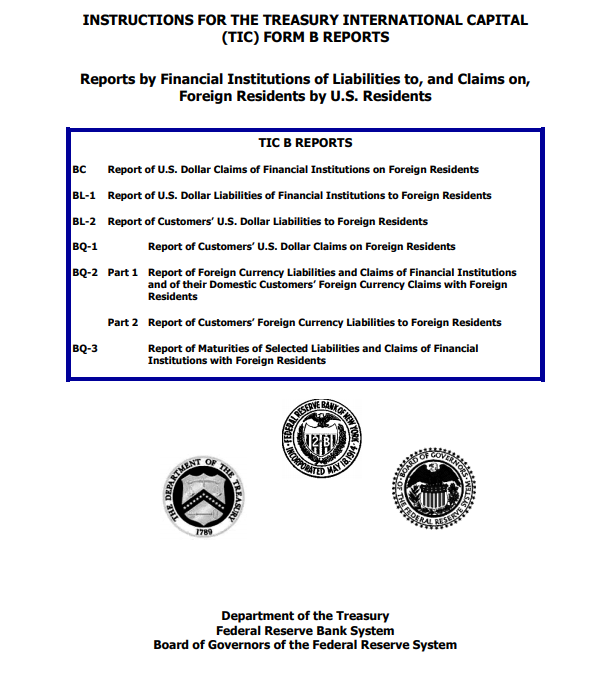 Sometimes those counterparties are the banks themselves, transfers, essentially, between a domestic HQ and its offshore subsidiaries (oftentimes that “offshore” subsidiary is actually located, physically, inside the domestic HQ; entities like IBF’s, for example, so long as they keep a separate set of books are treated as offshore even though all its operations are here in the US inside the domestic bank). The banking data embedded within TIC requires domestic firms to track certain resale transactions where they are creating a bank liability for it. Not surprisingly, the level of resales over the last eleven almost twelve years traces out recognizable patterns. It’s evidence we are after. 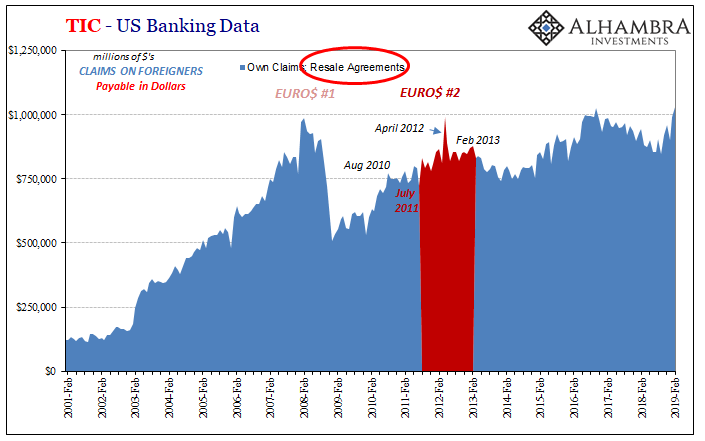 It doesn’t take very much work to calibrate the resale data with the last decade’s monetary experience. Beginning in August 2007, there was a slight pull-back in US bank resales. Domestic firms were reluctant to lend cash held (created) domestically into those offshore spaces. This was when LIBOR first jumped and fed funds dropped; the panic pattern. In January and February 2008, however, there was a spike in resales suggesting that offshore banks (including foreign subs) had become so desperate they offered terms for domestic cash that were reward enough to entice US national banks to lend – but only until Bear Stearns. After Bear, forget it. The resale market started to vanish which was a huge problem because as all this was going on the unsecured funding markets were decimated (risk aversion). Inside repo, MBS collateral was increasingly rejected which led to a scramble for UST’s (or German bunds, anything else similar – including PIIGS until 2010). During the worst of the 2008 panic, October to December, resales plummeted since you couldn’t get domestic banks (or foreign banks, for that matter) to lend interbank on any collateral. Total freeze inside repo and out. In the immediate aftermath, domestic resales rebounded as some global funding had been restored. Following August 2010, the TIC resale data falls into the up/down, reflation/deflation signals that we see practically everywhere else. From September 2010 (announcement of QE2) until June 2011, the level of resales dropped off slightly. Rather than suggest like during 2008 that overall funding markets were tight, it actually implied they were more liquid. Firms offshore apparently didn’t need extra liquidity from US bank offered resales. That all changed after July 2011. As Euro$ #2 developed, global tightness reborn, offshore firms increasingly accessed US bank liquidity via this eurodollar repo. The level of resales rose which further proposed higher demand for the collateral to be able to engage in them. Not surprisingly, bond yields fell during Euro$ #2. Strong worldwide demand for safe assets. Beginning February 2013, Reflation #2 appeared which in this context meant reduced demand for domestic resales. From then until December 2013, resales tracked bond yields; the latter rose as the level of the former declined. Less demand worldwide for safe assets. All that changed, again, right at the beginning of 2014 (CNY). Over the next two and a half years, Euro$ #3, the pattern was reversed. Resales rose while yields fell. 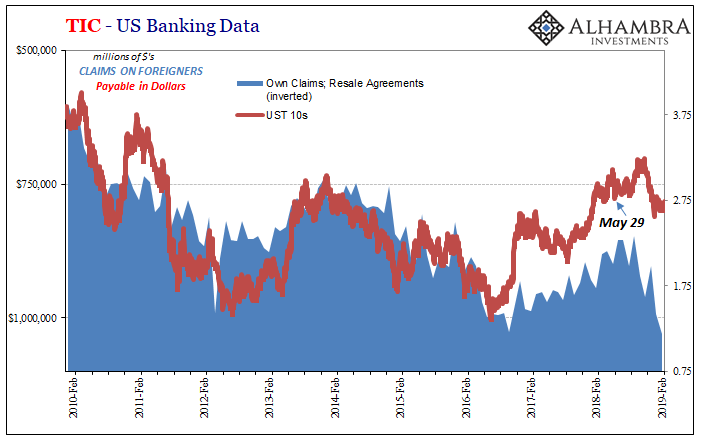 Demand for collateral to do cross-border repo increased because of general overall eurodollar tightness (which, especially during Euro$ #3, included tightness in FX forms of funding). This was followed by Reflation #3, which in the level of resales lasted until May 29 last year. As of the latest data for February 2019, US bank offered resales have skyrocketed particularly since October (no surprise). In February, the Treasury Department says banks reported a gross total of $1.03 trillion resales. That’s an increase of $176 billion since last June, a sizable chunk of liquidity demand for just one part of the global eurodollar system. Repo-of-last-resort? 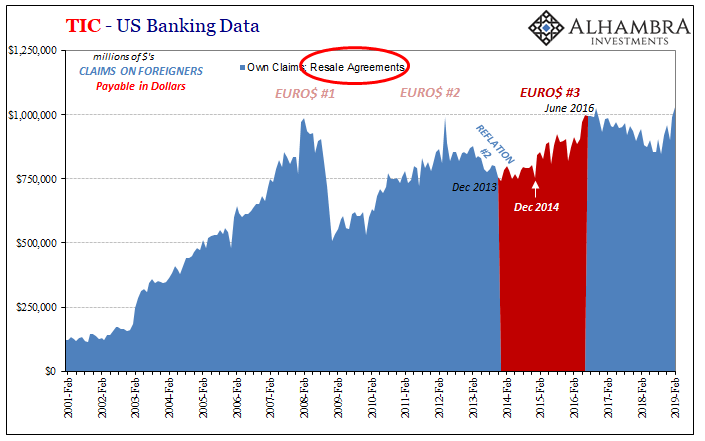 Given what we know went on during that period, as well as its consistency with the same pattern over the years, it’s reasonable to infer offshore eurodollar tightness bleeding into demand for domestic resales. Increased cross-border repo would further suggest strong worldwide demand for safe assets particularly since last October. May 29 was collateral, not Italy. 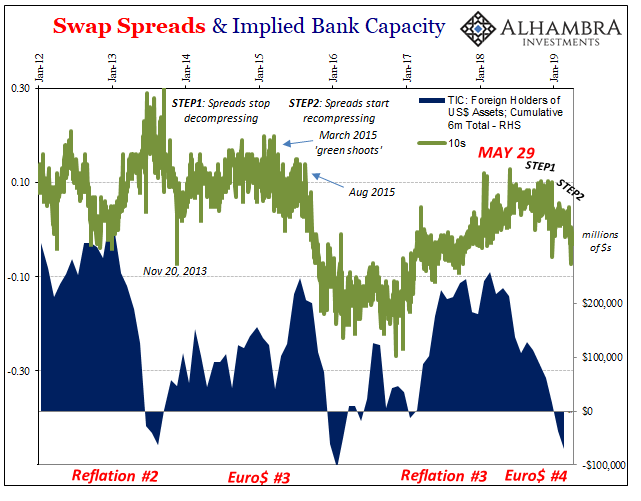 It was the start of something big, a broken system falling back into its usual chaotic state (note: on the chart below I’ve inverted resales to make it easier to see what sure looks to be a solid relationship between inferred offshore tightness and the demand for collateral and therefore what that does to bond yields). As helpful as this data is, it would be even more so if the Treasury Department wasn’t gathering it by mere coincidence. Had anyone in the government known or wanted to know (benign neglect) what’s really going on in terms of global currency, there would be a far broader mandate. They know it’s out there, they know it happens, but regulators just don’t understand or want to understand what they have in front of them. Securities lending and collateral transformation, which is what a security for security resale would be, are integral parts of offshore eurodollar money operation. From the perspective of the US government, though, all that matters officially is what is technically defined as cash. It is 1950 here. It doesn’t matter that in practice, and for half a century, effective global money is far, far broader. To the real economy, what the Treasury Department or Federal Reserve claims is cash doesn’t matter. While disappointed we are unable to make a further connection between cross-border repo (resales) and likely big problems with Eurobond collateral transformation, as I suspect, we can at least be somewhat satisfied that TIC’s banking data provides compelling evidence for our original purpose: “strong worldwide demand for safe assets” and more so what that really means in the overall context of Euro$ #4. And since resales spiked in January and February 2019, TIC displays the background for the curve collapse in March. It also doesn’t indicate much that’s good about the effectiveness of the Fed “pause.” The Fed might want to consider a rush on that whole standing repo facility (not that it would matter). If only someone at Treasury would realize what TIC really can be, and how crucial even this data already is just as a start, they’d not only expand its call reports they’d surely start releasing the data without such a substantial lag. It’s useful stuff, but it could be so very much more if given a little purpose. Balance sheet capacity shortage = increased demand for resales. Epilogue 1, money printing, is here.